Riverhounds’ Ryan Thompson and his Jamaican squad stand between the U.S. and the Gold Cup final. Make no mistake. For Jurgen Klinsmann and the United States Men’s Soccer team –capturing a sixth Gold Cup title — and earning a spot in the prestigious FIFA Confederations Cup in Russia in 2017 would be an important and necessary accomplishment for the U.S. as they enter the next cycle of competition leading up to the 2018 World Cup. In their way of reaching the Gold Cup Final stands Pittsburgh Riverhounds goalkeeper Ryan Thompson — and the Jamaican team — as the two men’s national teams will battle on Wednesday evening in Atlanta in the CONCACAF Gold Cup semifinals. Thompson, who was relegated to back-up role for the Reggae Boyz in their appearance falling short in three group stage matches in the Copa America tournament earlier this summer, finally had his chance as he was called into duty around the 20th minute of their Gold Cup final group stage match vs El Salvador after Dwayne Miller was injured. Thompson came up with numerous big saves to help Jamaica complete a 1-0 victory to help them take the top spot in their group. Great team effort last night against a tough El Salvadoran team. Also happy to have made my Gold Cup debut and was able to help my Country. Against Haiti in quarterfinals on Saturday in Baltimore, Thompson got the start, continuing his stellar play earning a second clean sheet as Jamaica advanced to the semifinals with another 1-0 win. The 30-year-old, who became the first Jamaican to play in the Champions League with Irish club Shamrock Rovers, told reporters after beating El Salvador. “I was proud to go out there and represent the country despite the circumstances. I was happy about my performance, but saddened by what happened to (Dwayne) Miller. While Thompson has missed out playing for the Riverhounds for a portion of their schedule which has seen some of their most exciting games played before sellout crowds and against an MLS side (DC United at Highmark Stadium on June 18), he has made the most of his opportunities thus far on the Gold Cup stage — and will now be playing before a large crowd in semifinal that will feature the two North American powers (USA, Mexico), a Central American team (Panama) and a Caribbean Island nation (Jamaica). 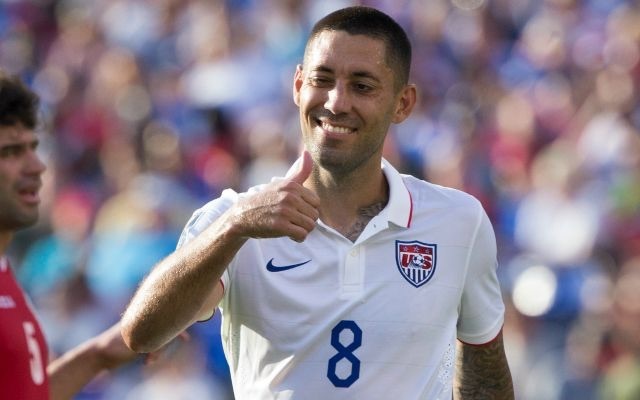 The United States cruised to a relatively easy 6-0 win over Cuba in their quarterfinal — thanks to a hat trick by Clint Dempsey who’s been terrific in the tournament scoring a total of six goals in the five U.S. games. As good as that result was for the US, it was against lowly Cuba. It’s important not to take too much away from that game, but the victory did give the US some confidence moving forward. The defense will get tested against Jamaica, so let’s see how it responds. Klinsmann made some changes to the roster after the Group Stages — adding veteran DeMarcus Beasley — who could see some action if the outside backs struggle. After struggling at times in the group stages, the midfield looked sharper against Cuba. Forward Aron Johannsson, scored, got an assist, drew and penalty and made great runs and needs to continue to play well, especially with the absence of Jozy Altidore, who Klinsmann took off the roster after group play due to fitness. The US will not take Jamaica lightly. The Reggae Boyz are playing well –have mostly been together since late May. They have 17 players played in the Copa America in June. Althought they went out in the group stage in Chile, it looks like they’ve brought confidence over into the Gold Cup, winning their group that included a very formidable Costa Rica (who they tied 2-2). No doubt, Jamaica has speed and talent in the attack, and the team should have a few good chances on goal against the US’ goalkeeper Brad Guzan. The backline has some strength but isn’t as talented or technical as top countries like U.S. and Mexico. The last time these two met was in Kingston, Jamaica, in 2013 in World Cup Qualifying match which the US pulled out an improbable win on Brad Davis‘ goal in the 93rd minute.